Hi again. 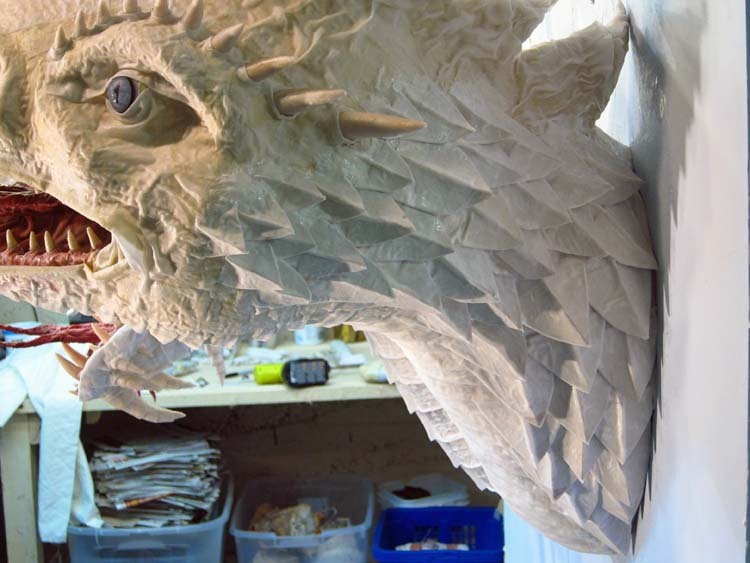 Time to assemble the White Tiamat dragon head. 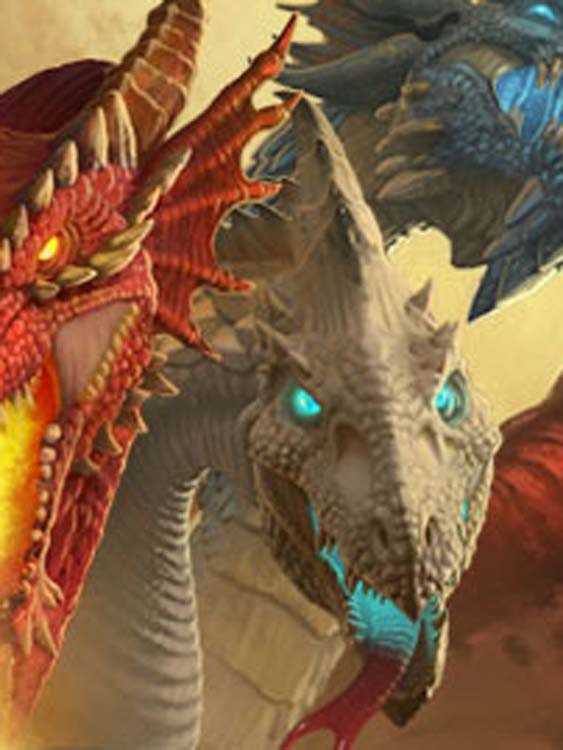 In my mind the white dragon should be more symmetrical, and maybe a bit prettier. Still fierce, but beautiful. 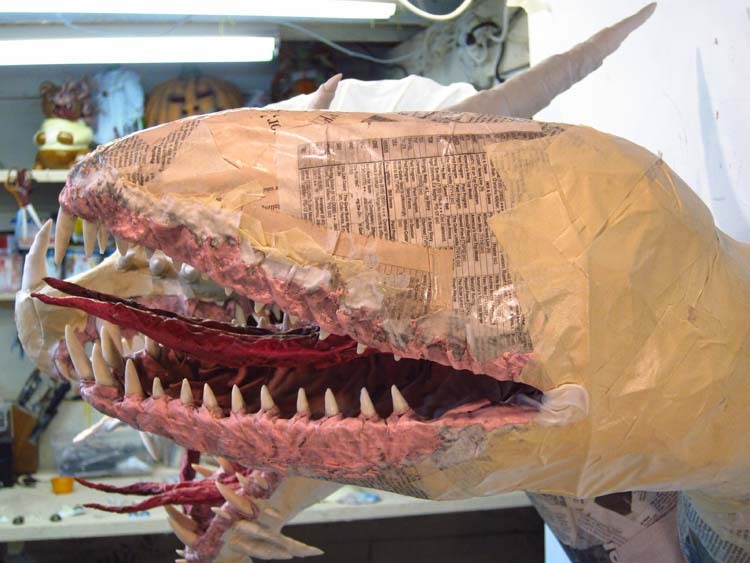 Once again I started by adding the jaws to the neck. 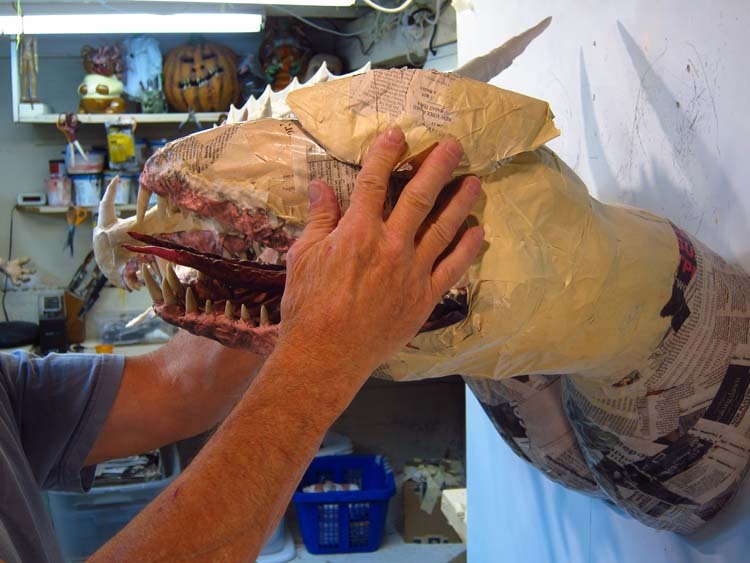 As always, I use the shells from paper mache balls to build up the top of the head. 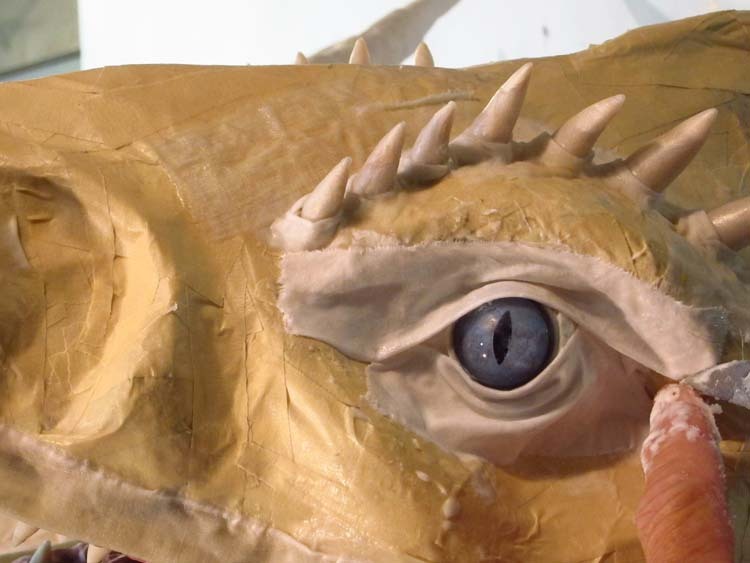 Using more paper mache shells, wadded paper, and masking tape, I added some nostrils, eye sockets and brows, and jowls. Have I told you how much I love masking tape? Yes, I know I have, many times. I don’t care. I love masking tape. 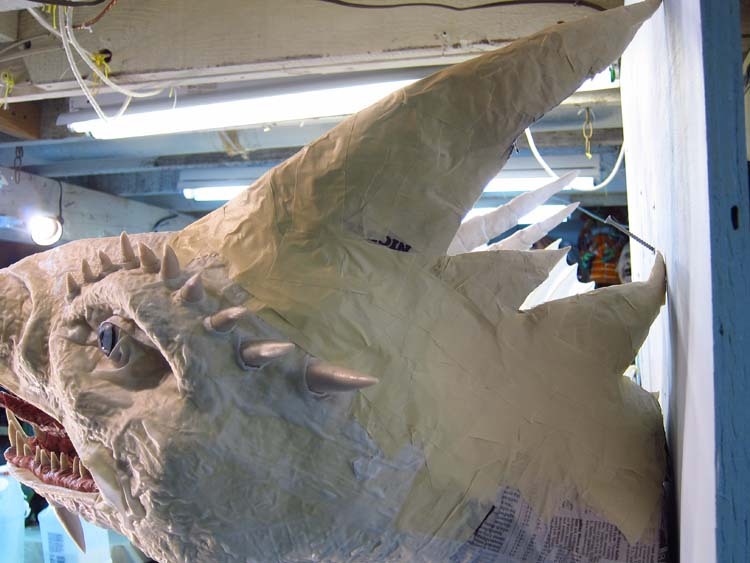 As I said in my Papier Mache Monster book, I’d marry masking tape if it was human, and I wasn’t already married. I tend to overuse masking tape. Then again, isn’t that what you do with things you love? I added some horns along the brows. Then I added some cloth mache eyelids. I also added the cloth to other parts of the face. 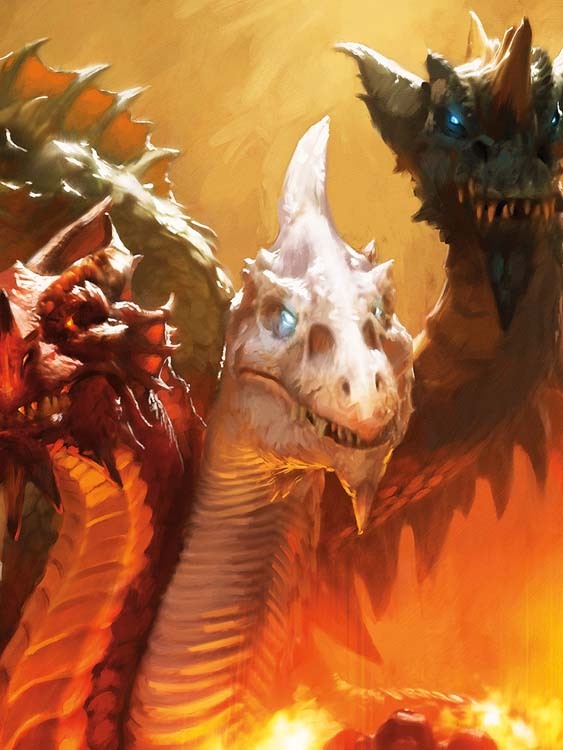 It’s time to take a look again at the official Dungeons and Dragons wallpaper. There is variation in the different paintings, but in most of them the White dragon has this long thingy at the back of the head. I know “thingy” isn’t the right word. But I don’t know what else to call it. It’s long and, in the wallpaper on the right, it has something akin to rings. It definitely is not a horn. 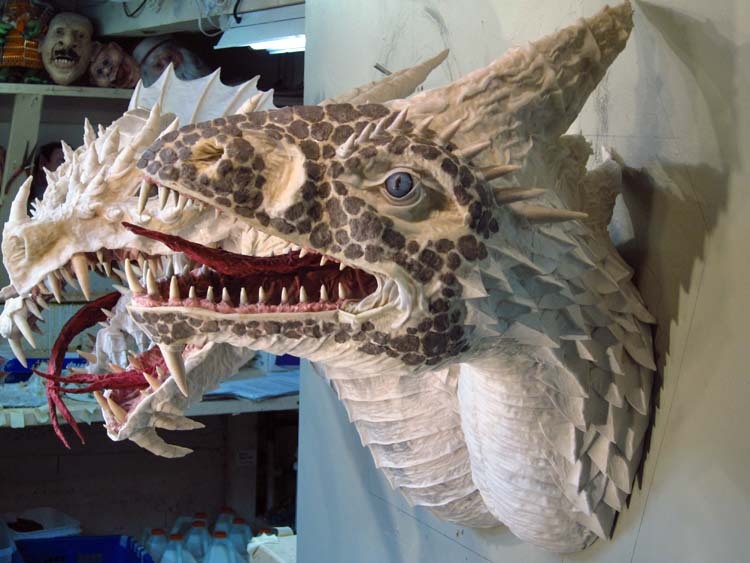 Also note that, overall, the White dragon has fewer horns that the rest of the heads. And, as I mentioned earlier, it is more symmetric. So I added the long thingy. Then, using my cloth mache I added the rings and some texture. Then I added scales on the neck. For this I consulted the written description of the White dragon. “The scales and limbs are heavy, making them seem ponderous.” So I made them heavy and ponderous, although I’m not exactly sure what it means to have ponderous scales. …and in various places on the rest of the face. 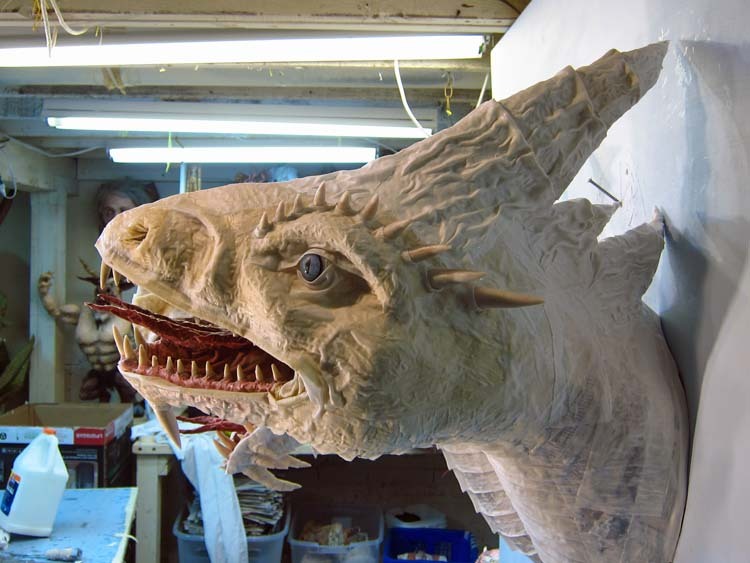 So here is the White dragon sans paint. It looks kind of goofy with the dark color of the spit wads. Those of course will be minimized when the paint is added. So here is the bottom row of the Taimat before painting. 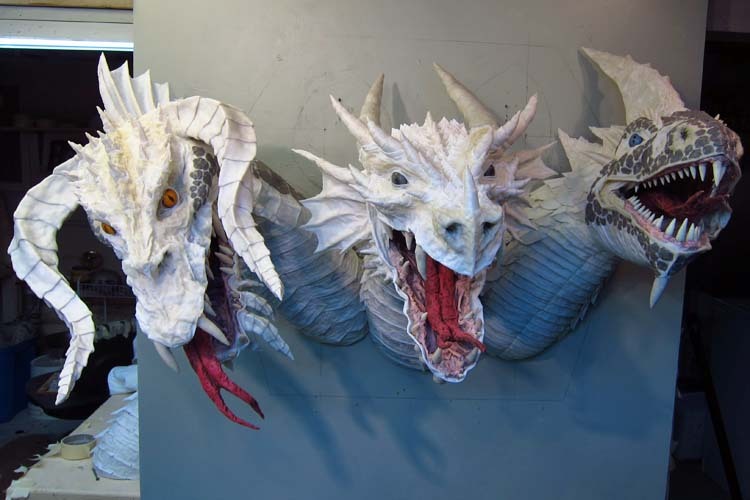 Left to right, the Black dragon, the Red dragon, and the White dragon. 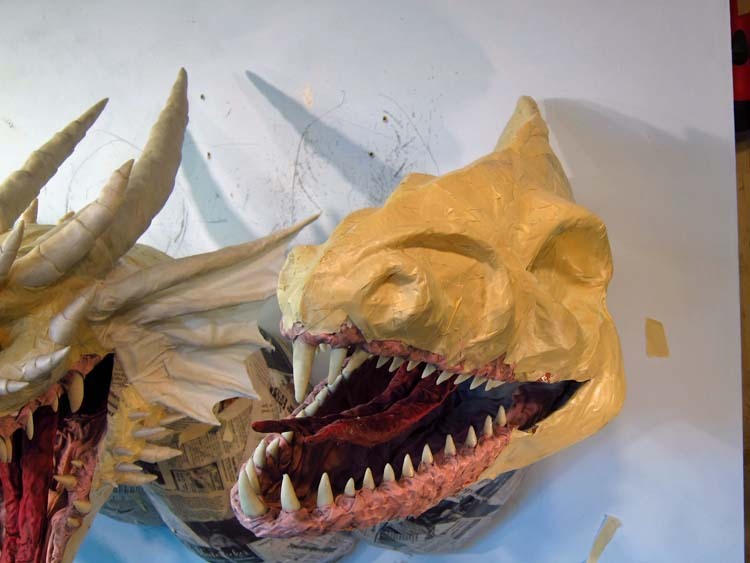 In case you haven’t been following, this Tiamat dragon is a commission for the Chromatic Dragon restaurant in Savannah, Georgia. Thanks for following! See you for the Blue dragon next. 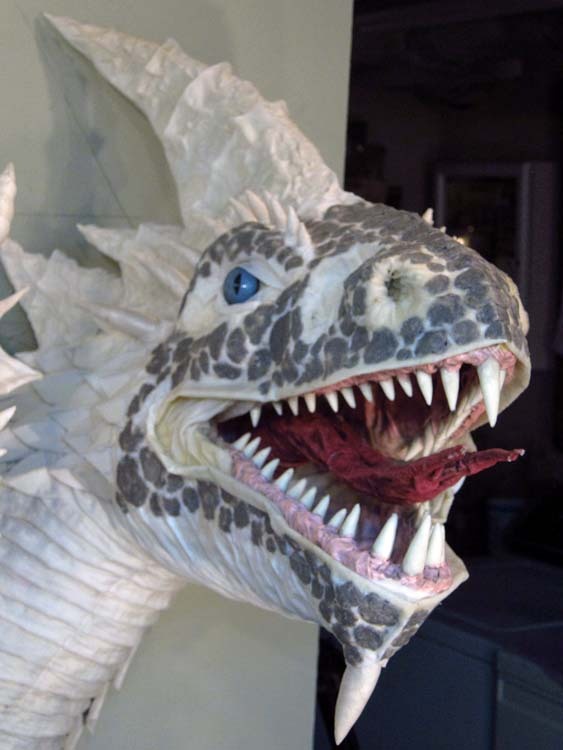 This entry was posted in Tiamat Dragons and tagged cloth mache, dragons, Dungeons and Dragons, fantasy, Game of Thrones, mixed media, paper mache instructions, papier mache, papier mache recipes, sculpture. Bookmark the permalink. One can see their individual personalities coming forth! Glad you like this Sessela. Hi Ginger. Glad you like these! Magnificent!!! Thanks for sharing. Looking forward to the next post. Thanks Suz. I like l.e.ds on some projects. Not on this one though. I’d have to do it for all five heads. Nice hearing from you. I only recently started reading your blog, but I’m already hooked by the artistry of your creations. Incredible! Also, would you call the “thingy” a crest? A crest! That would be much better than “thingy”. Thanks Matthew! These look amazing! I love seeing the process of putting them together. Will it be difficult to transport them to the restaurant in Georgia? Thanks Heather. Yes, they will be a real pain to ship. I will ship each head separately in a custom container. I’ve often said that making the container is as much work as making the project. Each one really does have their own unique features and personality. Quite incredible. I think the thingy is a gobbly goop. Yeah, that’s it. On second thought it probably is a thingy. Any estimate on the weight of this when you get it all done? Gobby goop would be a good as anything. Thanks Lori! I’m not sure about the total weight. I will ship the heads separately and they will assemble them on a plaque I made. 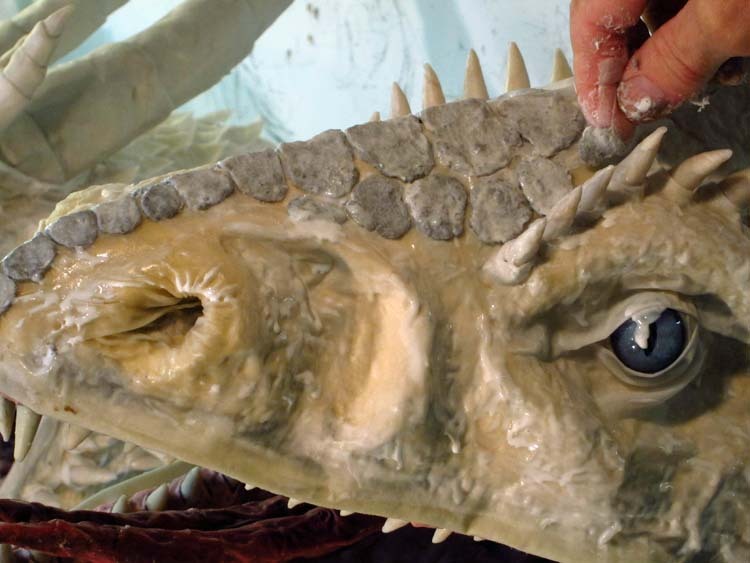 I know you use Fimo clay for the teeth but I just discovered that you can use false fingernails and trim them into the shape of teeth and they work very well with paper or cloth mache. The cheapest ones work very well. Thanks for the tip Ti! That sounds like a great idea! Yes, poor, white, and ponderous. What could be worse? Thanks Amy! I’m entranced with the effect of the cloth mache details – genius! Thanks Leslie! Detail is everything. Glad you are enjoying this. You know, I wonder whether the thing on the back of its head is a little like the frill on a triceratops’ head, but a different shape. Regardless of what it’s meant to be, what you’ve done looks great. Thanks Stella! I think it does work. And it’s consistent with the wallpaper, so people in the restaurant will recognize it. In particular paint will make this look good. Thanks for stopping by!